Choosing a splashback can be one of the most overwhelming decisions you need to make when installing a new kitchen or doing a full kitchen renovation. After all, a kitchen splashback is not only meant to protect the kitchen wall from splatters and spills. Now, more than ever, this area behind the sink and stove has become an essential part of kitchen design. With a wide range of materials like wood, glass, metal and stone available, your splashback can be one of the main design features to influence the overall look and feel of your kitchen. To help you find the best splashback for your kitchen, here are five tips to help you get started. 1. Mix and match colors and materials. Having a hard time deciding on which tile to use? Get a swatch for each one you prefer. Tape them to your kitchen wall and see how they look. Choose the main color and several accent colors that look best even when the light changes as the day goes by. Combine different materials to add interest. One way to mix it up is to use different sizes of the same material, such as glass tiles, for example. The little bit of variety in the design will give you a surprising and fanciful outcome. Do you want the splashback to be colorful, or do you prefer a neutral or more conservative look? Some homeowners feel that a neutral palette imparts a sense of peace and organization, while others are attracted to more colorful combinations that add vibrance to the home. Meanwhile, a bright white kitchen with dramatic color added through tiles or glass splashback allows you to enjoy the best of both worlds as it combines classic aesthetics and modern sophistication. 2. Consider the height of your splashback. The height of the splashback can significantly influence the look, perceived size and functionality of the kitchen. When doing a kitchen renovation, your designer can provide the best recommendations on where your splashback ends in terms of height. Most professional kitchen designers consider the cabinetry as the deciding factor. If you simply want a hint of tile, place your splashback toward the bottom of your first shelf or cabinet. 3. Choose the appropriate material. Choosing the material to use for your splashback is just as important as choosing the color. You have to figure out which material will work best with your overall kitchen design. You can find inspirations by visiting a display kitchens showroom or browsing through a kitchen design catalogue. You’ll not only get to browse through a wide variety of splashback materials but also get some modern kitchen design inspirations. Glass – If you want your kitchen to look sleek, glass is the way to go. You can fit it in large and seamless panels. Tempered glass is preferred for its durability because it’s less likely to scratch. Reconstituted Stone – This has been a favorite material of choice in the kitchen industry for years now, thanks in part to its stability, cost effectiveness, and its being relatively stain-resistant. Made with a combination of quartz granules (91 to 94%) and polyester resin (6 to 9%), reconstituted or engineered stone comes in a large variety of colors, and is tougher than granite. It is easy to maintain as long as stains and dirt are immediately wiped or scrubbed off, and is also less likely to crack compared to stone. Laminate – Laminate is affordable and comes in various finishes and colors which resemble real stone and wood. Although laminates don’t give a similar sense of luxury, its high-definition printing and texture make them look realistic. Your splashback will always be right up on your benchtop so it’s important for these two elements to work well together. 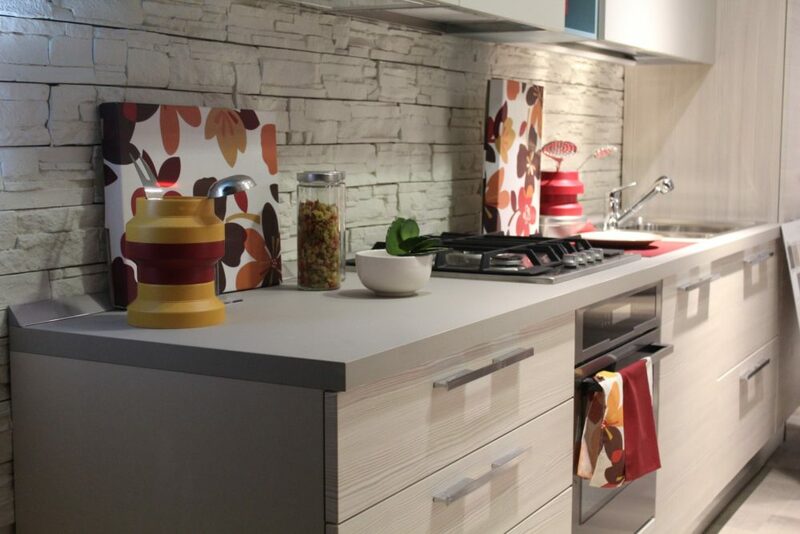 If you opt for a colorful material for your benchtop, choose a neutral color for your splashback. And if your benchtop is neutral, choose a splashback material that will complement its tone and texture. 5. Go for value for money. Before you start your dream splashback project, set a clear budget first. If you have a tight budget, choose splashback material with a standard field size. While intricate materials and special shapes may cost you more, your designer can also suggest exciting details, such as pops of patterns and colors, that you can add to your splashback without requiring extra costs. As with any decision for your home, keep in mind that cheaper isn’t necessarily better. Choose a solution that lets you get the best value for your money. No matter the scale, choosing and installing a kitchen splashback to suit your new kitchen will take time, effort and money. To avoid costly mistakes, consult with a professional kitchen designer to come up with a splashback (and a kitchen) that fits your budget and personal style. Done right, your splashback can be one of the best design investments and a much-loved feature in your home for the years to come.